These last few weeks of school are brutal--for us and the students. They don't want to be there, and we don't want to fight for their attention. If you've been following my blog for the past few weeks, you know I've been counting down to summer break with spring survival tips. If you haven't, feel free to check out tips #9, #8, #7, and #6. Just click on the numbers to read what you missed. This is a particularly difficult time of year. Remember the first few days of school when you could talk and talk, and the students would listen? Those days are rapidly fading from my memory as the end approaches. We have to keep on, though, don't we? There's still more to teach. So. Much. More. But why force-feed the curriculum if we don't have to? And we don't have to...most of the time. I used to think that the only way for them to "get" what they needed to know was for me to tell them. And that works sometimes. Yet, at the end of the year, I find that they just don't listen. They may act like they do. But they don't. 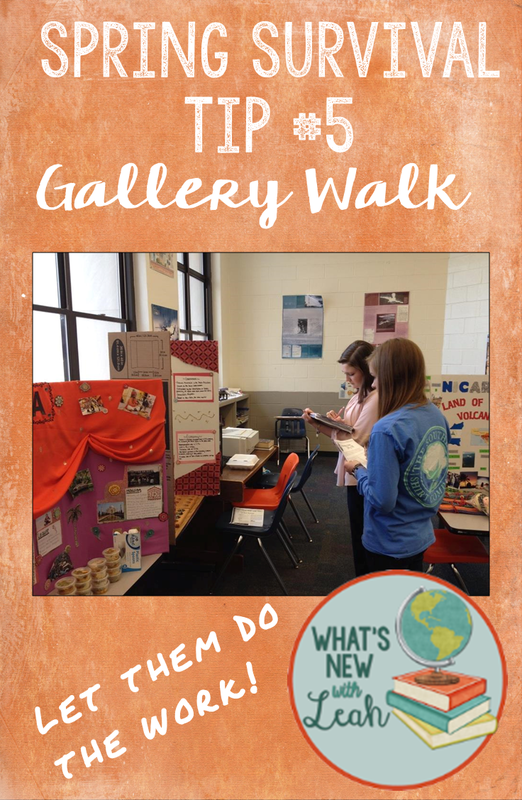 That's where a gallery walk really helps. With a gallery walk, they can tell each other. So try assigning students a task--it can be a well-planned-out project that they research and put onto decorated trifolds, or it can be a series of task cards, split-up, that they place the answers for around the room on chart paper. Either way--give students a task. Have them post information around the room, turn the students loose to rotate and take notes from the chart paper/ posters/trifolds. Then give them a quiz from their notes. You work less-they're engaged more. It's a win-win. At the end of the year, this is what they want, and what you need. Be sure to check out my FREE Culture Gallery Walk HERE. How do you keep your students engaged and yourself sane at the end of the year? Leave a comment below, and let me know! Leah, that's so cool. We did that one year where each class had a different region of the world. We were the Amazon with products and food. We built a forest in a corner of the room with all the layers. This was all before NCLB. I bet your kids had a blast putting it all together! That sounds like so much fun! I wish we had the ability to still do things like that. Thanks for sharing, Pamela.